Q. When remodeling your home what is the first thing you should do? A. The first thing you should do is find qualified, licensed contractors to provide you with written estimates for the work you want preformed. Q. In what order should I start remodeling? A. The first place to start should be your ceilings. If you begin with the ceilings and then move to the walls the floors will be the last thing completed. Q. I have acoustic ceilings that are old and dirty what can I do. A. There are a couple of different things you can do. They can be re-sprayed with more of the same material allowing for a clean ceiling or they can be removed and the ceiling textured to match the walls, the texture is then painted and your ceiling are fresh and new. This also updates your home. Q. How long does the process take to remove acoustic? A. The whole process takes anywhere from one to two days depending on what we do and the size of your house. Sometimes it can take three days if your house is large. Q. 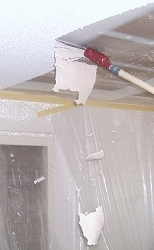 After we have our ceilings textured will the new texture need painting? A. Yes the new texture will require paint; this is a service we also provide. Q. Do I need to move all of my furniture out of the house to have my ceilings scraped? A. No, all you need to remove from the room that we do are breakables. Things like lamps, knickknacks, anything that is setting around on shelves or tables that could be knocked over by plastic. If you have glass top furniture we ask that you remove it. The rest of the furniture can stay where it’s at. If our guys need to move something out of their way they will.